There are many reasons to choose Sicily for your next vacation. Aside from the wonderful food and wine, and cooking classes taught by friendly locals, the landmarks of our rich history draw people here. 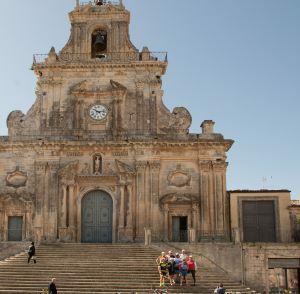 A bike tour allows you to experience Sicily at your pace, so you can truly appreciate every stop on the journey, including those listed by the United Nations Educational, Scientific, and Cultural Organization as worthy of preservation. Agrigento: Located on the western coast of Sicily, Agrigento has a rich architectural and cultural history dating back to the 5th Century BC. The influence of ancient civilizations is still evident in the Valle dei Templi, the Valley of the Temples, where you will find the ruins of several temples to Greek and Roman gods. When you customize a self-guided biking tour of Sicily with Siciclando, we can help you experience Agrigento as part of your itinerary. Mount Etna: How close would you come to a volcano? When you fly into Sicily via Catania to begin your cycling tour, you’ll enjoy a lovely yet distant view of the island’s most famous peak. As you ride through this region you’ll also see lava walls and others formations created from previous eruptions. A hiking trip to Mount Etna is also available as an extension of our Taste of Sicily Bike Tour. Syracusa and Pantalica Necropolis: In ancient times, Syracuse served as an influential center of culture and education. Today, visitors can explore the ruins of temples and amphitheatres from the Roman Empire, and many churches and palazzos representative of the majestic Baroque era. Toward the end of our Sicily Baroque tour, you’ll have the opportunity to enjoy Syracuse and the nearby Pantalica Necropolis, which is comprised of thousands of ancient cave-like tombs. These final resting places, dating as far back as the 7th Century BC, were cut into the rocky terrain and remain preserved as one of our country’s sacred sites. Aeolian Islands: A visit to this chain of tiny islands off the northern coast is a highlight of our Taste of Sicily tour. UNESCO named this area a World Heritage Site based on its lengthy history of volcanic activity. Over the years, residents have adapted to life close to volcanoes, and you can explore their charming villages along with gorgeous views of the sea. 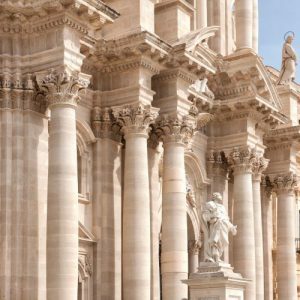 Val di Noto and the Baroque Valley: The Val di Noto region along the southern coast is where you’ll see the finest examples of art and architecture of the Sicilian Baroque era – ornate piazzas, domed cathedrals, and elegant archways. it’s one reason why we named one of our most popular biking tours as such. These sites give you the impression of traveling back in time to see the influence of 18th century Spanish culture and style. Together, Sicily and Italy are home to over 50 UNESCO World Heritage Sites, and Siciclando guided tours take riders through most of them. We are also available to craft custom, self-guided routes through specific sites you’ve longed to visit. Make 2019 the year you fulfill a dream vacation to our beautiful country. Contact Siciclando for information on booking a Sicilian or Italian cycling tour.